What Should A Presidential Candidate’s Resume Look Like? Do Testimonial Ads Matter To You? Here is a testimonial ad from the Frank Rizzo campaign for Mayor in 1987. Rizzo was the former mayor of Philadelphia and this was his comeback campaign. Rizzo lost to incumbent W. Wilson Goode in this election. Do testimonial ads make a difference to you when you cast your vote on Election Day? Why are testimonial ads used? Recall elections involve the removal of a government official through a petition process and a follow-up vote before that official’s term has ended. The most famous recall elections in recent history involved the recall of Governor Gray Davis (D-CA) and the election of Arnold Schwarzenegger (R) in 2003 and the failed recall of Governor Scott Walker (R-WI) in 2012. Nineteen states have a recall process. Why do you support the primary that you have chosen? 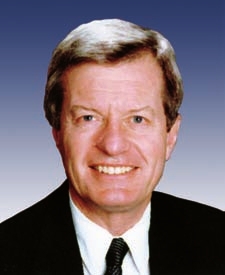 On Tuesday, April 23, Senator Max Baucus (D-MT) (pictured) announced that he was not running for re-election in 2014. He joins a long list of Senators who have announced that they will not be candidates for re-election in 2014. They are Saxby Chambliss (R-GA), Tom Harkin (D-IA), Mike Johanns (R-NE), Tim Johnson (D-SD), Frank R. Lautenberg (D-NJ), Carl Levin (D-MI), and Jay Rockefeller (D-WV). Two other Senators, Jim DeMint (R-SC) and John Kerry (D-MA), resigned. Listed below are the months and years as to when each Senator first began his term. With the exception of Lautenberg, each of these Senators would have had a relatively easy re-election in 2014. Lautenberg would have faced a tough primary challenge in Newark Mayor Cory Booker (D). If Lautenberg survived that primary, he would have won in the general election, since New Jersey trends Democratic electorally. The question remains, “Why retire?” If the chances for re-election were quite high, then why move on?